Industrial Manufacturing School, Chengdu University, Chengdu, Sichuan 610106, China. To improve the oil film force for enhancing lubrication effect and reducing wear and increasing service life within radial friction pair of internal involute gear pump, the oil wedge for hydrodynamic lubrication effect was the better solution. On the basis of related theory of hydrodynamic lubrication, from the two arc surfaces adjustment of crescent board inside and outside, the current parallel radial gaps were made into non-parallel radial convergence gaps with oil wedge structure for hydrodynamic lubrication effect, so the current single hydrostatic lubrication state would be changed into the combination state with hydrostatic lubrication and hydrodynamic lubrication. In the case of the radial gap on the inside arc surface of crescent board as a example, From the maximum oil film force conditions, the best convergence ratio of inside radial gap could be derived, and then the new center position and new radius value of inside adjusted arc contour of crescent board were calculated. All results indicated that, after the current parallel radial gaps were replaced by the nonparallel radial best convergence gap, the oil film force and the volumetric efficiency of pump would be significantly improved, under the case parameters, the best convergence rate with the initial pressure difference of 1.9 MPa was 0.96, but the corresponding best convergence rate without the initial pressure difference was about 1.2, at the same time, the oil film force was increased by 92.4%, the liquid flow rate brought into the discharge oil cavity from the absorption oil cavity of pump was increased by 30.2%; at the same time, the higher the driving speed and the thinner the minimum oil film thickness and the lower the discharge oil pressure is, the greater the best convergence ratio and the bigger the oil film force or the increase of the oil film force and the higher the pump volume efficiency and the more obvious the hydrodynamic lubrication effect and the greater the liquid flow rate brought into the discharge oil cavity from the absorption oil cavity of pump is, it could be said that the higher the driving speed was, the more obvious the hydrodynamic lubrication effect, but the less obvious the hydrostatic lubrication effect, in contrast with this, the higher the discharge oil pressure was, the more obvious the hydrostatic lubrication effect, but the less obvious the hydrodynamic lubrication effect; because the adjustment value of the inside arc contour of crescent board was smaller, in practical application, these factors such as manufacturing error and elastic deformation and thermal deformation must be comprehensively involved in the oil wedge structure design. 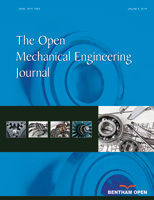 Finally, the important conclusions are obtained that the design method of oil wedge structure on the inside and outside arc surface of crescent board is proved feasible, as for other such as straight line conjugate internal gear pump with crescent board, the relevant content of this paper also can be used for its oil wedge structure design, but because of oil wedge structure, so the design method of oil wedge structure of radial gap only b appropriate for one-way internal gear pump.